Over a two hour show The Boy of the title, hence known as Tape Face, utters not a single word, strip of black tape across his mouth and with dark eyeliner, he is quite a sight. It is truly a clever and well defined character in itself, kited out with satchel and stripy top, before he gets into his elaborate and hilarious set-pieces. Pacing the stage from long before the show begins and finally settling on staring out the audience via his wall mirror. 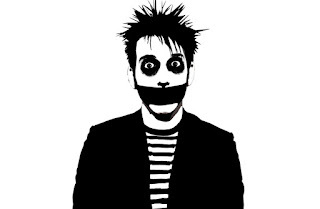 Our location is his dressing room, the audience perhaps his dream creations, as Tape Face drifts into a deep sleep to the company of the shipping forecast. What follows are a serious of truly silly, mostly preposterous, but outright hilarious skits, often featuring members of the audience. Many pieces are driven cleverly from music, others from such things as Rubik's Cubes and golf clubs. All moments leaded to glory as not one piece fell flat, as the audience participation worked at all times, because Tape Face clearly has the talent to make it work. This show also fails to conform to the "safe area" of audience participation as Tape Face on a couple of occasions whipped himself up to the dress circle, where I was seeking safety (I knew a little about the show beforehand). There but for the grace of Royal & Derngate, I could so nearly have been blaming it on the boogie. I did feel sure he was pointing at the chap next to me, who like me appeared to have a dodgy leg. In retrospect, I actually feel sad about that, as this, like my previous stint on stage (The Play Goes Wrong as I keep telling people), would have been an amazing show to be part of. No one is cruelly ridiculed, this is kind, friendly and family safe. I loved everything (and got to see that plate trick live for the very first time. Amazing!) and would have happily sat watching all night. Tape Face deserves every success in the future with this truly brilliant show. 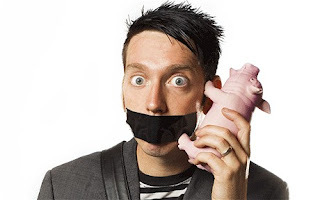 I posted after that it was one of the best theatre experiences that I have had, This is no lie, it offers an endlessly funny evening of laughter, which cannot come more recommended if you get the chance to see him. I don't fancy the task of cleaning up the theatre after though. Performance reviewed: Monday 7th November, 2016 at the Royal & Derngate (Royal), Northampton.